xFaceMAC32 is an Ethernet media-access controller. It receives and transmits Gigabit traffic concurrently (full-duplex). The xFaceStream32 interface allows direct network access for software and for hardware. The xFaceMAC32 allows receiving and transmitting Gigabit Ethernet traffic with minimal hardware resources. It is applied to connect systems on chip with the Internet. 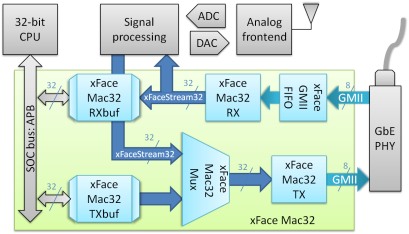 xFaceMAC32 provides direct access to the network for digital hardware via the xFaceStream32 bus. This allows high throughput applications with minimal latency because no software interaction is needed.